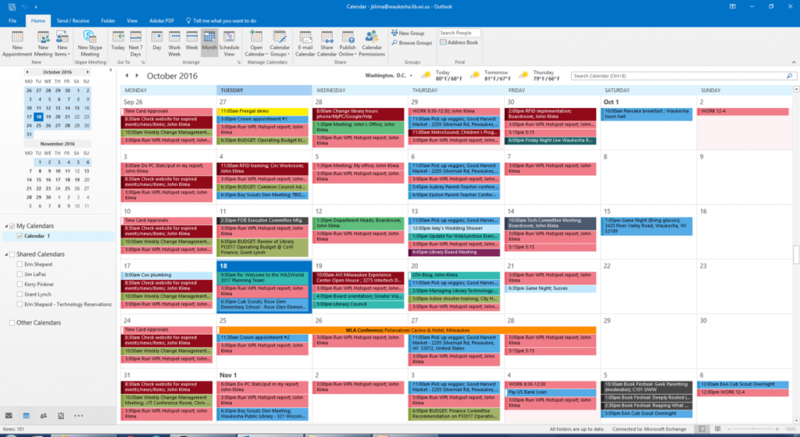 This works slightly differently depending on the version of Office you’re running but in every version you can drag the email to the calendar or to-do list icon in the lower left of you screen and then create a new item from there. For example, let’s say I’ve had a back and forth email discussion about our public fax service with the vendor. I want to look into the problem before we open. I drag the latest email to the calendar icon and create an appointment for myself for the next morning using that email. The entire email discussion is part of that appointment and I can set reminders, categories, etc. just like creating an appointment from scratch without losing the thread of the discussion. It’s not just appointments either. Recently several staff and I talked about the need for RFID check-out/check-in training. I dragged that email to the calendar, invited attendees, and created a meeting so that we could sit down and do the training. All the discussion we had was in the meeting request so that everyone had that available to them. My library uses email reminders for almost-due books, so I drag those emails to my to-do list, create a reminder date and time, and then I get a nice pop-up so that I can renew or return my books as needed. If you use Gmail and Google Calendar, you can do a similar thing except you don’t drag and drop, you use the ‘more’ drop-down menu when you either select an email or open it. Under that drop-down you’ll see Add to Tasks or Create event. You can add tasks to your default list or create new lists for projects or categories. Similarly, you can create events from emails and put them into your own calendar, a shared calendar, add guests, etc. I love being able to take an email thread and move it into a meeting or a to-do list without having to recreate the conversation. It’s so easy to do and makes it do that I don’t lose track of what I have to do. How are you using Outlook or your mail client to increase your productivity? General information Calendar, Email. permalink.